2013 - The 9th Annual webBikeWorld.com Motorcycle Product of the Year Awards! Just don't call it a "cruise control"! 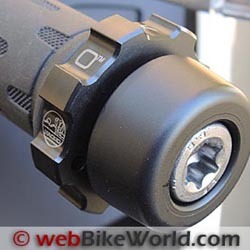 The Kaoko Throttle Control (review) is a beautifully made device that looks like an OE part. It takes a bit of practice to get the hang of it, but once you do, it's as simple as rolling on and off the throttle. 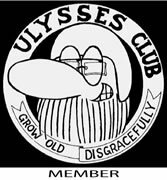 If you're super-slabbing it, you need one of these! Super easy to install and virtually foolproof, the Kaoko Throttle Control is the next best thing to the full-on, automatic cruise control system you don't have and couldn't get even if you wanted to. It's a real pleasure to find such a simple device that's so ingeniously designed and that makes life in the fast lane that much easier. That's why the Kaoko Throttle Control gets the webBikeWorld 2013 Motorcycle Accessory of the Year award! The Shoei GT Air (review) was reviewed way back in March of this year but nothing since has come close to beating it. The GT Air has it all: good looks, very low noise levels and the most effective ventilation system we've ever experienced in a full-face helmet. It also has outstanding outward visibility with a huge, specially designed Pinlock anti-fog insert and the GT Air even has a very effective unique internal sun visor that rotates up into a special cavity in the helmet shell. The optical quality and clarity of the face shield and sun visor are also the best you'll find in any motorcycle helmet. Back it all up with Shoei quality, a comfortable liner and outstanding aerodynamics that make the helmet feel like it's slicing through the air. 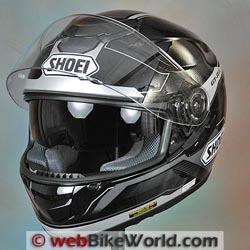 If you're a "Neutral" to "Long Oval" type head, there's nothing that beats the Shoei GT Air, the webBikeWorld 2013 Motorcycle Helmet of the Year! Call it what you want -- the "Motorcycle Helmet Value of the Year" or the "Best Motorcycle Helmet Under $250.00" or simply the best darn helmet bargain you'll find at any price. No matter how you slice it, the HJC CL-17 (review) is too good to pass up for an award. The HJC CL-series is one of the most popular motorcycle helmet types in the world, and no wonder. It has excellent build quality with features that work and a bargain-basement list price. That's the winning formula! 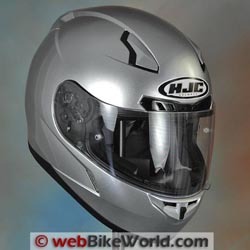 HJC tinkers with the CL series helmets on a regular basis and the HJC CL-16 (review) was already a super bargain but the CL-17 updates it with modern styling, excellent ventilation and all-day round-head comfort. The CL-17 is also certified to the Snell M2010 standard and the best part is that you can buy one for around $126.00. There simply isn't a better helmet at this price...or maybe any price. That's why the HJC CL-17 is the webBikeWorld 2013 Motorcycle Helmet Value of the Year! Pilot has been supplying motorcycle clothing to familiar brand names like Honda, Kawasaki, Suzuki and Yamaha. That flying-under-the-radar approached has all been changed, however, and now you can buy motorcycle clothing with the Pilot brand name. And if the company's first product is any indication, we're in for a treat. The Pilot Trans-Urban jacket (review) was introduced at the inauguralAIMExpo dealer show (report) and it's a winner. The Trans-Urban jacket has a surprising number of very usable features with rugged and excellent build quality, all for a very low asking price of $225.00. You can even buy the optional chest and back protectors for the jacket, rare at any price. That's why the new Pilot Trans-Urban jacket gets the 2013 webBikeWorld Motorcycle Clothing Product of the Year Award! Bluetooth intercom systems continue to improve and 2013 was a banner year, with updates and new products being announced at a fast and furious pace. The fierce competition has resulted in features we could only dream of a year ago, including music sharing and website-based intercom setup and management. This meant yet another close call this year but Cardo Systems did it once again with the new Cardo Scala Rider Q1 and Q3 (review). As we stated in the review, the Cardo Scala Rider Q1 Teamset and Q3 Multiset systems are absolutely the most complete and comprehensively packaged systems on the market today. 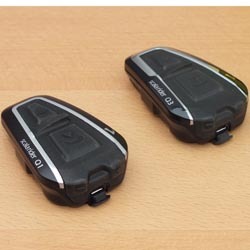 Cardo went all-out and came up with a slimmed-down, up-scaled, easy-to-use and price-competitive Bluetooth intercom system: the Cardo Scala Rider Q1 and Q3, the webBikeWorld 2013 Motorcycle Intercom of the Year! Safety and protection have always been primary webBikeWorld concerns and we've been promoting safe gear, helmets and clothing since the very beginning of the website 14 years ago. The Racer R-Safe Gloves (review) are both the webBikeWorld 2013 Motorcycle Protective Product of the Year and the webBikeWorld 2013 Motorcycle Gloves of the Year. They're among the most protective motorcycle gloves but they're also surprisingly comfortable for a race glove. The real magic is in the design, with redundant protective features that provide a greater feeling of security. It's all here, including kangaroo leather, a huge swatch of SuperFabric and the complement of Knox SPS scaphoid race protection sliders. The price is reasonable for this level of protection and you can wear the R-Safe gloves on the street or track. That's why the Racer R-Safe gloves get the nod for the webBikeWorld 2013 Motorcycle Protective Product of the Year award! Best wishes to everyone for a happy, healthy, safe and prosperous 2014!